"Today, we are taking historic action to defend the United States and protect our citizens against the dangers of a new era. With my signature, this act of Congress will create a new Department of Homeland Security, ensuring that our efforts to defend this country are comprehensive and united," said President George W. Bush. Includes improved information sharing between the law-enforcement and intelligence communities, allowing nationwide search warrants for e-mail and subpoenas for payment information, and to place those who access the Internet through cable companies on the same footing as everyone else. 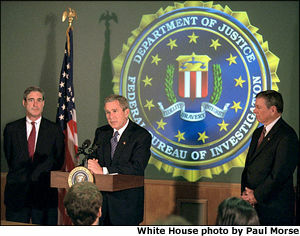 The President moved swiftly following the attacks on September 11 to protect Muslims from hate crimes and the Department of Justice followed his lead by having their Civil Rights Division sponsor community forums in Chicago, Illinois, and Dearborn, Michigan, on combating ethnically motivated violence as a result of the September 11th terrorist attacks. The Department of Justice, the U.S. Equal Opportunity Commission and the Department of Labor issued a joint statement against employment discrimination in the aftermath of September 11. Rewards for Justice offers more than $5 million for information that prevents acts of international terrorism against the United States. The U.S. government has offered a reward of up to $25 million for information leading directly to the apprehension or conviction of Osama bin Laden. Created 93 Anti-Terrorism Task Forces -- one in each U.S. Attorney's district -- to integrate the communications and activities of local, state and federal law enforcement. The FBI created a national task force to centralize control and information sharing resulting in hundreds of thousands of leads, searches and interviews of witnesses, and numerous court-authorized surveillance orders.